Schoharie Town Supervisor Gene Millone addresses the media as Congressman Chris Gibson and State Senator Jim Seward look on. Schoharie County Sheriff Tony Desmond was joined by other officials in saying that it has been more than three and a half years since Irene ravaged the county, flooding out the public safety building, which houses an 89-bed jail, emergency medical services, sheriff's headquarters and the county communications center. "On August 28, 2011, we were flooded out to the whole Schoharie Valley. Right here in this building where you stand now there was 8 fee 9 inches of water. Since that day, we have not been able to get back to where we belong to operate the sheriff's office and the correctional facility the way they should be operated," said Desmond. FEMA has yet to make a final decision on how to fund restoration of the public safety building. Expenses have been mounting because the county has had to transport inmates to and from Albany County, which involves deputies sometimes making multiple trips per day. State Senator Jim Seward: "FEMA and the federal government have failed to come through with the necessary support and decision making that's needed to help Schoharie County fully recover from the impact of Hurricane Irene. This breakdown, in my mind, perpetuates that widely held notion that government red tape and inaction holds back progress." Officials say New York State actually forbids rehabbing the existing building, which sits in a flood plain. Congressman Chris Gibson noted that it would cost over $40 million to refurbish the standing structure, as opposed to $37 million to build a new state-of-the-art public service building on higher ground. FEMA is said to be leaning toward refurbishing... "That makes absolutely no sense, that we would spend more money to take on more risk." Gibson cited "climate change" as the reason to relocate rather than rebuild. He added that he is extremely grateful FEMA has dispersed $44 million throughout the county, but it's time to get the county building issue settled. "We're calling on the Obama administration to make the decision. This has been going on way too long, this way overdue for all constituents who want to weigh in on this and support what we're doing here today, they can call the White House. 202-456-1414, and join us in bringing this to light to the administration once again, and putting pressure on them to get a final decision on this matter." Schoharie Town Supervisor Gene Millone says it's not only a question of the Public Safety building being replaced: "It's important for you to know that we lost our fire station in the village of Schoharie, as a result of the flooding event. There's been an ongoing effort with FEMA to have that facility replaced. Our equipment is scattered about, response time is affected, and yet there is no answer from FEMA." Millone went on to blast FEMA: "It's unconscionable that almost four years later there's been no response to major issues plaguing many of our towns and villages throughout this county." Gibson believes the press conference he called forced the Fed's hand. FEMA spokesman Don Caetano: "We continue to work with the State of New York to find alternatives or options to address the situation that the Congressman brought up. We are in dialog with the state and we look forward to finding a resolution one way or another to help with this situation." 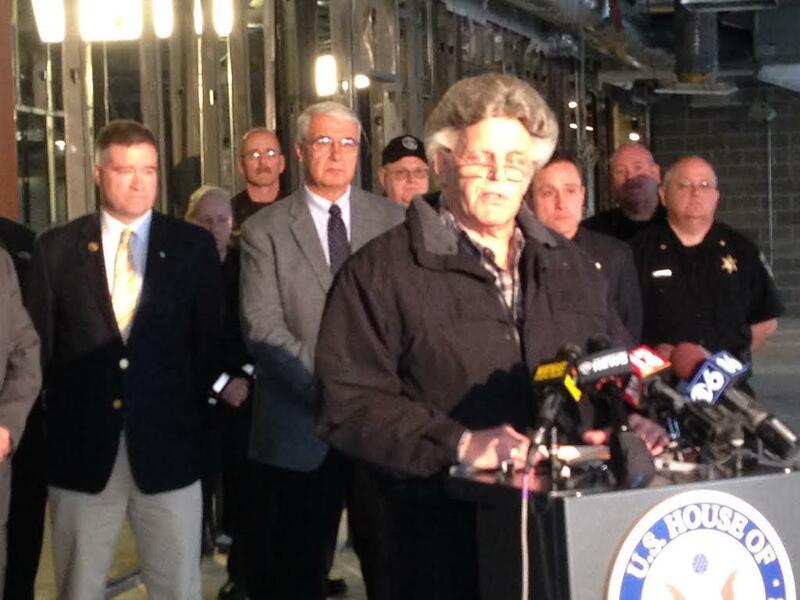 FEMA officials are expected to be in Schoharie to meet with local officials next week. Responding to the “Rising to the Top” challenge issued by Governor Andrew Cuomo's office, Windham joins other New York communities striving to come up with ideas for long-term flood recovery following Irene, Lee and Sandy. Years after the three storms, people are still waiting for funds. Grant money for the Greene County town of Windham was set aside by Governor Cuomo's office earlier this year, part of a $60 billion federal effort to assist areas hit hardest by Irene, Lee and Sandy.